JDC - Archives : Sub-Carpathian region, circa 1920's; inside photo of rattan weaving class, making chairs and baskets. (Transcarpathia; Subcarpathian Rus/Ruthenia; Subcarpathia; Carpatho Ukraine). Title Sub-Carpathian region, circa 1920's; inside photo of rattan weaving class, making chairs and baskets. (Transcarpathia; Subcarpathian Rus/Ruthenia; Subcarpathia; Carpatho Ukraine). 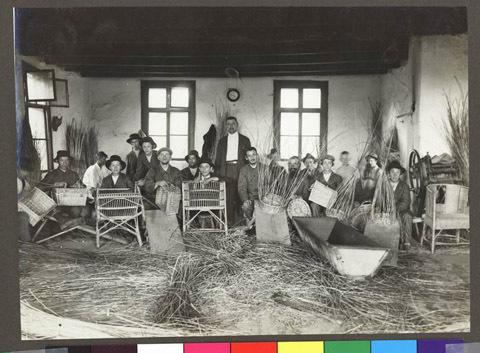 Description Sub-Carpathian region, circa 1920's; inside photo of rattan weaving class, making chairs and baskets. (Transcarpathia; Subcarpathian Rus/Ruthenia; Subcarpathia; Carpatho Ukraine).